WASHINGTON – The decision to install a 3 MW wind turbine at Glencore’s Raglan mine came after nearly five years of careful investigation, assessment, and analysis, says Jean-Francois Verret, director of strategy, projects, and public affairs. Because of the Arctic conditions at the mining site, which sits on the Ungava Peninsula, in Nunavik, roughly 1 800 km north of Montreal, gathering in-depth data was an essential first step. This summer, the Raglan mine began installing its first wind turbine, manufactured by Enercon, in Germany. If all goes as planned, Verret predicts that this wind turbine would replace about 5% of the mine’s diesel consumption – or 2.4-million litres of diesel. A project like this also holds out the promise of significant cost savings. At the Raglan mine, energy typically accounts for 18% to 23% of operating costs. If the wind pilot goes well, Raglan was considering installing additional wind turbines that could generate a total of 9 MW to 12 MW of energy, slashing the mine’s overall diesel consumption by 40%. In 2009, Raglan launched a study to investigate options for the mine and its fully diesel-powered operations. The nickel/copper mine’s remote locale meant that it would be impossible to connect to the hydroelectric grid or to the natural gas network. Very quickly, said Verret, the study showed that wind was a promising option. Raglan placed wind measurement systems around the property and began collecting data. Only after simulations and gathering concrete data did the mine team approach corporate for approval. Verret emphasised the importance of having actual numbers to bolster the first approval request, which was made in 2010/11. “The intention of that request was to inform corporate that Raglan mine was sitting on a very intensive wind current, and it was worthwhile to study [wind] technologies,” he says. Next, Raglan conducted a benchmark study in Alaska, Switzerland, and Scandinavia to observe how wind turbines fare in harsh climates. The company then embarked upon a scoping study, looking at how the investment framework would work with select manufacturers experienced at working with Nordic or Arctic parameters. The company created a financial framework in November 2012, which combined government incentives for reducing greenhouse gases and grants available to companies using renewable energy. Once a financial framework was in place, the energy team again approached corporate. Choosing to buy from Enercon was not a difficult decision because there were so few manufacturers producing Arctic-class wind turbines, says Verret. What was truly innovative was the decision to incorporate three storage technologies – a flywheel, batteries, and a hydrogen storage loop with an electrolyser and fuel cells – in addition to the wind turbine. With innovative storage technologies, however, the penetration level of the wind turbine can increase up to 35% to 55%. The purpose of this first project was to test the three storage technologies in Arctic conditions to be educated buyers when it comes time to deploy a larger wind farm at the mine site. 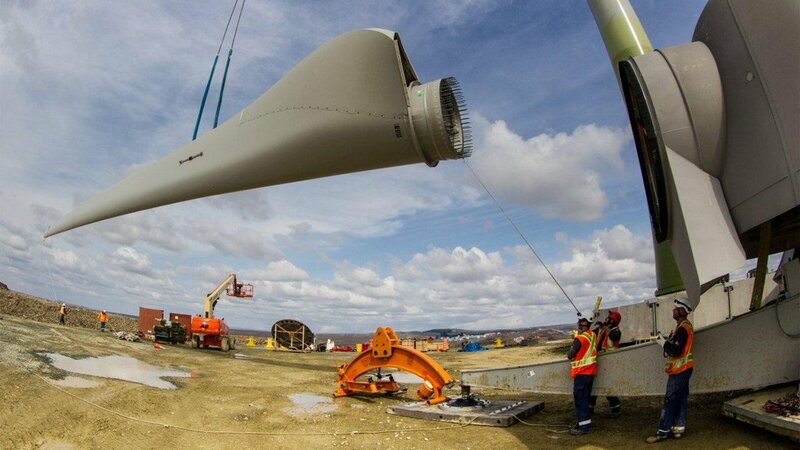 The 3 MW turbine was strategically located at the mining site, where it can be isolated from the grid. The objective of the project is to achieve high penetration on this micro-grid within the five-year demonstration period for the storage technologies. To illustrate the potential of storage technologies, Verret explains that the Raglan mine would use a flywheel to help “smooth the energy curve” because the levels of wind produced in a given area aren’t stable. The flywheel increases and improves upon the wind energy available to the company’s own internal power grid. In the northern Quebec region where the Raglan mine is located, summer generally lasts just a single month, and, in fact, construction during this July had to be halted because of snow, says Verret. In addition, the fact that the mine is not linked to roads meant that all wind turbine components, which were built in Germany and Quebec, had to be transported by ship. “The construction schedule is very tight so you need to manage the internal project management – that’s one of the most critical components,” he says. Once Raglan’s first wind turbine is in operation, the company would embark upon the construction and implementation of the second phase of the project: the three storage components. The second stage of construction was slated to run from September until March 2015. Permitting is a key component of the project management timetable. Another challenge is the financial framework. “It’s always a challenge for the mining industry to invest in renewables because most of the time the renewables are a little bit more expensive,” says Verret. Financial challenges are exacerbated by the fact that the mining industry tends to be extremely volatile. For renewables, however, provincial and federal grants help to reduce financial risk, he says. Raglan mine’s partner TUGLIQ Energy was of great help identifying eligible governmental programmes and obtaining the funds. One method of storage – using the hydrogen produced by wind turbines for other purposes – might eventually lead to a wider array of green opportunities at the Raglan mine, Verret said. He explained that wind energy takes a molecule of water and creates both hydrogen (H2) and oxygen. By storing the H2 in a tank, the mine can later combine the hydrogen to create energy for running vehicles. “We’d like to test using the hydrogen produced by the wind turbines for our own vehicles instead of using diesel,” he said. At the Renewables and Mining Summit in October, Verret hopes to explore innovative ways of using the energy generated by its new wind turbine. “I look forward to having some good discussions about how we can use that technology for other ground mining opportunities,” he concluded. Verret would be speaking about the Raglan mine project at the Renewables and Mining Summit and Exhibition, Toronto, October 15 to 16.